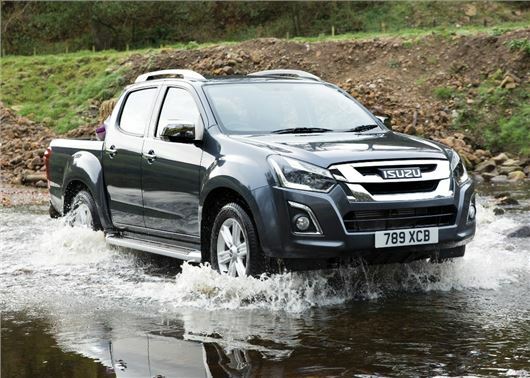 Business users who are mourning the passing of the Land Rover Defender should look to the 2017 Isuzu D-Max as a viable successor. At least that’s the opinion of the company’s marketing people – but their suggestion that it could take on an icon is not without merit. The D-Max is a little bit different to most of the more recent additions to the pick-up market, which has seen significant growth of over 10 per cent in the past year alone. Whereas the likes of the Nissan Navara, Mitsubishi L200 and even the Toyota Hilux have grown softer, rounder, more refined and have a more leisure-oriented character, the D-Max is very much aimed at the more utilitarian user. This is immediately noticeable from the styling. While other pick-ups have gone for flared arches and bulbous curves, the D-Max retains its straight, no-nonsense styling. It doesn’t look particularly dated, but it’s certainly more traditional than most of its rivals – and in many ways that’s not a bad thing, as in higher spec trims it’s a handsome thing. Square, beefy and with plenty of road presence. Arguably, it lacks flair – but simple, boxy looks didn’t do the Defender any harm over the years, and if that’s the market where the D-Max is aimed, then bulbous curves aren’t necessarily a good thing. Externally, the truck differs little from the 2015 D-Max, with only revised bumpers, new LED daytime running lights and a reprofiled bonnet marking it apart. Inside, the higher trim levels (Utah and Blade) get leather trim and a new centre armrest, and an updated digital display, featuring a gearshift indicator on manual models. There are also some nice design touches, from new integrated head units that are compatible with Android and Apple Car Play to cup holder indentations on the rear tailgate, so you can use it as a simple picnic table or tea break station when on a job. Otherwise, the biggest changes are under the skin. The D-Max comes with a new 1.9-litre Euro6 compliant engine developing 164PS and 360Nm of torque, along with two new six-speed transmissions, manual or auto. At idle, the new engine isn’t the quietest, especially when cold, but out on the road it’s notably more refined than its predecessor, especially at cruising speeds. The performance is fairly lively, too, though in manual models the first two gear ratios are quite short, with first operating primarily as a crawler gear. Given that the D-Max has a towing capability of 3.5-tonnes (as demonstrated on the media launch by towing a batch of previous generation D-Maxes on four-wheeled trailers) this is no bad thing. The auto is a much better companion for users who are less focused on pure utility, and the new ‘box is a marked improvement, with adaptable ratios to suit driver style and near seamless changes. It has a sequential shift override, which serves little purpose in normal use, but comes into its own when towing or used off-road. Indeed, it’s the off-road capability of the D-Max that really stands out, whilst also adding credibility to those Defender-related claims. It has better ground clearance than most of its rivals, especially in Utility spec, where there are no side steps or chrome adornments to get in the way. All models, regardless of transmission, come with shift-on-the-fly transmission, switchable between 2WD, 4WD High and 4WD Low while on the move, with the gearbox’s internal software taking charge of when to engage the chosen drivetrain. Even on road tyres, the D-Max has prodigious grip, while the long-travel throttle makes it much easier to regulate off-road speed and engine revs, albeit at the expense of feeling a little stunted in performance on the open road. In total, there are five different specification levels and three cab types to choose from. The Utility (from £15,749) can be had as a single, extended or double cab, while the plusher Yukon model comes in extended and double cab mode. Overall, then, the 2017 changes bring the D-Max up to date, and while there are other pick-ups on the market that are better dynamically, or have a more sporting image, there are few that can match it pound-for-pound in terms of out-and-out grunt. It’s a pick-up of the old school, but that’s not meant as a criticism, for as a working vehicle you’d struggle to find a more useful companion. Prices start from: £15,749, claimed economy: 40.4mpg, CO2 emissions: 183g/km, payload: 1126kg, towing capacity: 3.5 tonnes (braked), length: 5295mm, width: 1860mm, height: 1785mm, engine: 1898cc four-cylinder in-line turbodiesel, power output: 164PS.